In the middle of the Araneta Coliseum saw two players who would make Tito Mico Halili and the rest of #Minions proud. As Jordan Bartlett started to make his way to their side of the court, Aljun Melecio was there, standing toe-to-toe aganst him, shadowing his every move. Both players are similar in many ways. They’re of similar height (sub-six foot) and play at a breakneck speed every time they step on the court. Most importantly, both minions are fearless, attacking defenses with no hesitation no matter how tall front lines are. There is one big difference though. Show a picture of Jordan and Aljun wearing casual clothes to a person who has zero knowledge regarding UAAP basketball. Chances are, they’ll say that Aljun is an athlete. He could be a bodybuilder, or a basketball player (the correct answer), or maybe someone says he’s a wrestler. It’s a valid thing to say. If Aldin Ayo is mistaken to be a gym instructor, Aljun is the student who consumes protein with as much hesitation as when he shoots. When Jordan came out of the pressroom after La Salle and NU’s clash, he was sporting a white shirt, along with a pair of pants, shoes, and of course, the signature black earrings he wears. His physique and outfit screamed model more than basketball player. It was easy to have a first impression of Jordan as someone who was pa-pogi. Some fans thought, the only reason he made it to the line-up of NU was because he has American lineage. As soon he steps on the court versus Pinoys, he’d be beaten down to a pulp. Versus the Green Archers, Jordan got his first taste at a championship contender in the Philippines. You couldn’t blame him if he was feeling nervous for this particular game. La Salle was missing the services of Ben Mbala, but they still had the likes of Aljun, Andrei Caracut, Kib Montalbo and Jollo Go to throw at Jordan. Surprisingly, he wasn’t feeling any nerves before the game against the Green Archers. “I got out all the nervous energy during our first game,” shared Bartlett. “After that, you kinda get used to how loud it is in the atmosphere here. When Coach Jamike called me off the bench, I was ready to contribute.” When that moment came, you could here some fans shrieking as Jordan made his way to the court. Understandable, considering his reputation to fans as a pretty boy. But Jordan didn’t want to play in order to contribute cheers from fans crazy over him. He wanted to produce, and help his team pull off the upset versus the Green Archers. In an instant, Jordan made an impact for the Bulldogs. He took advantage of the fast pace of the game, attacking the defense of La Salle repeatedly using his patented dribble drive. He was fearless, something Jordan attributes to his roots in the States. “Growing up, I played against great competition. I think it was just that, East Coast toughness that was instilled in me early,” mentioned Jordan. Fans continued to cheer for him, but not because of his good looks. He was receiving praise because of the toughness and smart play he was showing on the court, like how all athletes should be discussed in the first place. Numerous rookies love to attack the rim ferociously, but Jordan showed he was no regular rookie. He displayed absolute grace, speed and control every time he made his way to the basket. Being able to manage one’s speed is something even some professional basketball players have trouble doing. Jordan was out here showing skill and polish as a freshman going face to face against arguably the best collegiate team in the country. The control Jordan showed was more evident when he’d pass the ball to his teammates more than the instances where he would score against defenses. Early on, Jordan would easily get to the rim to score. Most young players would think “Oh, okay, I’m getting my points. I’ll just keep pushing to score no matter what!” But Jordan didn’t do that. Every move he made towards the bucket wasn’t done in order to score multiple points for his own name. It was meant to help the team, as he made the correct play at an almost perfect rate versus the Mayhem defense of La Salle. After the game as media interviewed Jordan, you could immediately feel that sense of togetherness within the team. The team, from the coaching staff, the players, and even the staff were happy for how they played. The Bulldogs may have lost the game, but seeing their brother, Jordan, receive credit for the performance he put on was enough to give them a smile on their face as they left the Smart Araneta Coliseum. Jordan, however, isn’t intent on letting the praise get to his head, especially with how the game ended for him. Jordan is many things. He’s stands at around 5’8”. He isn’t the biggest basketball player out there. Others will continue to call him pa-pogi. But you can’t deny that he’s someone who is a fearless competitor. Even though he competes, he doesn’t let this get in the way of being a team player. 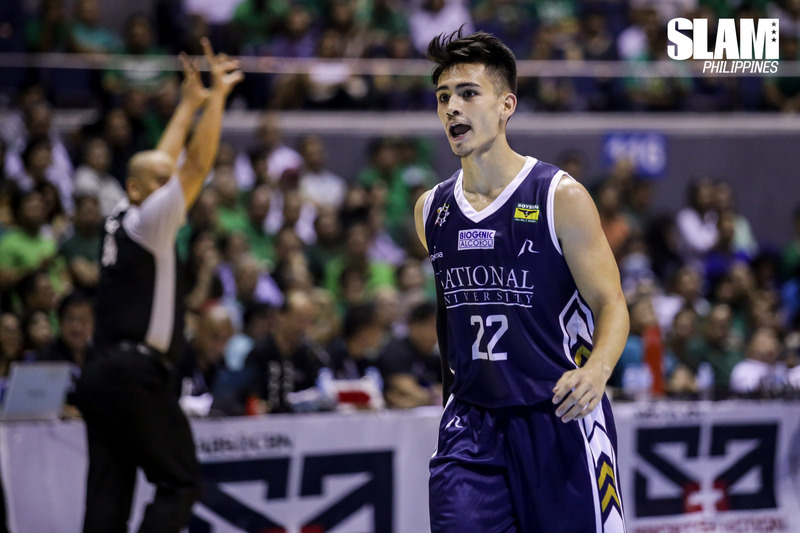 He may be in a completely different home now compared to where he was last year in the United States, but he’s learned to embrace the NU Bulldogs team he’s been blessed. Wait, team is cutting them short. NU has become a family for Jordan. He put on quite a show versus the defending champions, but Jordan isn’t settling. He wants to become a better all-around player. He’s hungry for knowledge, in whatever form these may be. This isn’t because he wants more articles to be written about him. Instead, he continues to work in order for his family to win the games they need to win in order to contend for a Final Four slot. The Bulldogs gave Jordan a home. With his fearlessness, selfless attitude and constant desire for growth, Jordan hopes to help in giving the Bulldogs glory once more.